Even color-at-home pros can’t be perfect all the time. So what do you do if you’ve accidentally applied hair color where it wasn’t intended -- like on your skin? 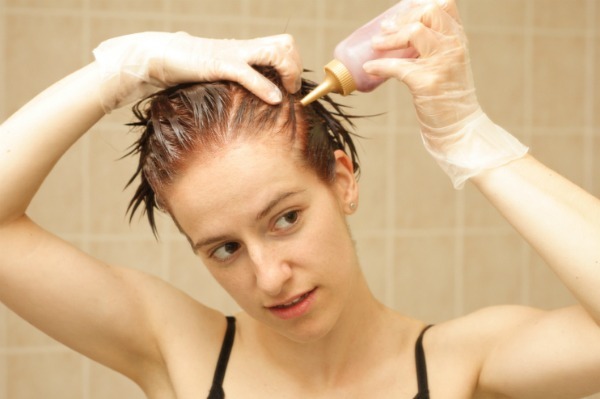 Here are a few cheap and pain-free ways to remove hair color from where it doesn't belong. There are plenty of "old wives tales" around how to treat the common problem of stained skin as a result from dyeing hair. If you can act quickly, your best bet is to lightly wet a cotton ball with some warm water and gently wipe the "slipped" hue away before it can set into the skin (it usually takes several minutes before the color has a chance to truly permeate). The other foolproof method lies in preventing hair color skin stains before they start. Before you put on your colorist gloves, apply a dab of conditioner, Vaseline or lip balm around the hairline and other areas you know are subject to dripping color (like earlobes, eyebrows, the jawline and the nape of your neck). Adding moisture to sit on the skin will provide a "barrier" that color can't attach to or stain. Further, having a visual cue of your "danger zones" can help to mentally manage your color application. Dab a cotton ball or Q-tip in olive oil, and gently rub on the stained area until the colors fade. Spray a bit of hairspray onto a cotton ball. Before the color has time to dye, rub the cotton ball onto the stained area of skin to break the bond of color to the skin. Mix some baby oil and facial cleanser together, and apply to the stained area with a washcloth. Apply in a gentle, circular motion to exfoliate. If your skin is not sensitive, you might even try a bit of nail polish remover on a cotton ball. Apply to the stained color to remove.